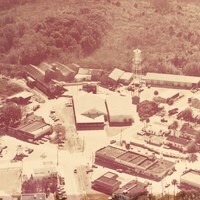 The Nelson and Company Packing Plant, as well as the Wheeler Fetilizer Company Plant. The company was originally founded by Steen Nelson and Gus Nelson and called Nelson Brothers. The company changed its name to Nelson and Company after it became a three-way partnership between the brothers and Benjamin Franklin Wheeler. In 1923, Wheeler became sole owner after buying out the company. The Wheeler Fertilizer Plant was a holding of Nelson and Company. 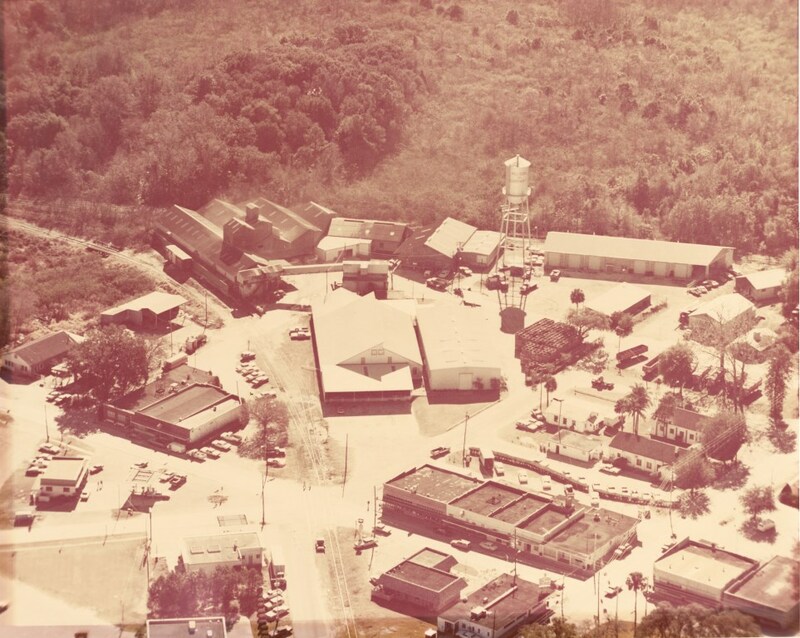 The original plant was destroyed in a fire in 1947, but eventually rebuilt six months later. Nelson and Company is located in what is now the Nelson and Company Historic District, and was incorparated in September of 2001. The 80-acre district encompasses four of Nelson and Company's historic buildings. 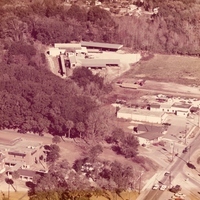 This photograph was taken by Henry DeWolf in 1973 for an aerial survey of Oviedo. Original 20 x 16 inch color photographs by Henry DeWolf: Private Collection of Arthur Evans. Digital reproduction of original 20 x 16 inch color photographs print by Henry DeWolf. Originally ceated by Henry DeWolf. Copyright to this resource is held by Henry DeWolf and is provided here by RICHES of Central Florida for educational purposes only. Rajtar, Steve. "Oviedo Historical Trail". Steve Rajtar. http://www.geocities.ws/krdvry/hikeplans/oviedo/planoviedo.html. DeWolf, Henry. 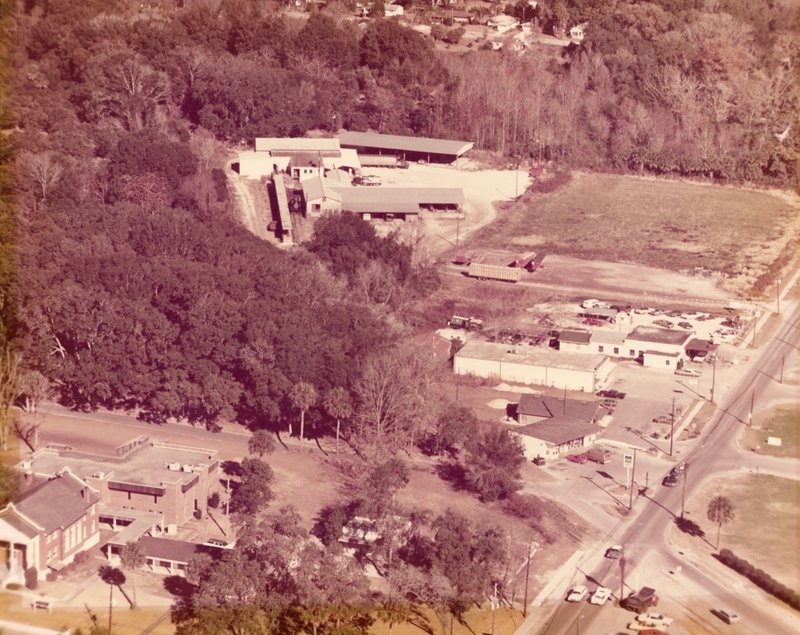 “Nelson and Company Packing Plant and Wheeler Fertilizer Plant, 1973.” RICHES of Central Florida accessed April 26, 2019, https://richesmi.cah.ucf.edu/omeka/items/show/5201.